The Beatles’ 1967 transcendent album Sgt. Pepper’s Lonely Hearts Club Band won four Grammy awards, spent fifteen weeks at number one in the United States, and in 2003, Rolling Stone magazine named it the Greatest Album of All Time. The Beatles set a high bar. Covering an entire Beatles album is gutsy. The Flaming Lips took on the challenge, but they probably shouldn’t have. With a Little Help From My Fwends, is, to put it politely, overwhelming. It’s excessive. It’s cacophonous. It’s Beatles blasphemy. This “tribute album” album covers all thirteen of the songs from the original Sgt. Pepper’s Lonely Hearts Club Band. Most of the songs sound roughly the same — well, much worse, but sometimes vaguely similar. The classic songs are embellished with the same effects, but with the exception of “Lovely Rita,” drowsy and shouting seem to be the only two singing styles. If you enjoy screamo, the new pseudo-title song, “With a Little Help From My Friends,” is for you. “What would you do if I sang out of tune?” the singer asks, and a frightening voice bellows, “WOULD YOU STAND UP AND WALK OUT ON ME?” The original title song, “Sgt. Pepper’s Lonely Hearts Club Band,” is equally disturbing. It starts with the buzzing of bees. There’s an explosion, electronic pulsing, and then, suddenly, in comes a creepy voice muttering the lyrics. “Lucy in the Sky with Diamonds” begins well, but that’s only because the intro is just like the Beatles original. As soon as Miley comes in moaning like Lana Del Rey, everything goes wrong. She slides sleepily through the lyrics with an obvious lack of effort. An organ starts playing, the word “gone” is repeated a few dozen times, and the music warps and crashes like fuzzing televisions being thrown through panes of glass. The song is a collection of those awful pet peeve sounds like static electricity, the scraping of metal, the screeching of speakers when you test them out, and that awful humming that gets stuck in your ears when you drive up to the mountains. Torture tunes: a new genre of modern music. The song ends with more electronic buzzing, more crashing, and a synthetic bubbling sound that obscures any musical remnants of the original Beatles tune. Did The Flaming Lips put any thought into the miscellaneous noises they layered over the classic hits? There’s much whooshing, much high pitched white noise, much drum pounding, and the electric humming of a light saber battle, but the beautiful melodies I grew up listening to are nowhere to be found. Perhaps the smashing sound I keep hearing is the continuous destruction of one of music’s greatest albums. “Lovely Rita,” was above average. The first “Ahhh” was painfully flat, but I enjoyed the percussion in the beginning and the chorus was light and entertaining. Unfortunately, when no one was singing, I had to listen to the sound of a screeching monkey, someone burping, and dogs barking. A more old-fashioned listener might describe it as musical sacrilege. I wonder what The Flaming Lips told Miley Cyrus before she went into the studio to sing “A Day in the Life.” Maybe something along the lines of “sing it like you just woke up” or “think mumbling, not music.” Perhaps With a Little Help From My Fwends could have used a little less Miley Cyrus. With a Little Help From My Fwends is confusing. 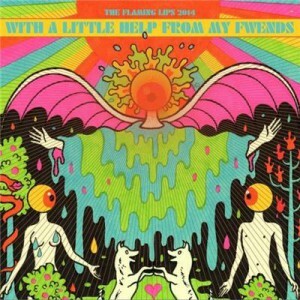 The Flaming Lips drenched an iconic album and I can’t understand why. Were they trying to make a statement? Are they harbingers of a violent end to traditional music? Perhaps The Flaming Lips are just incredibly innovative, and in the future I’ll be seen as one of those ignorant critics who doesn’t appreciate revolutionary musicians. But, despite featuring the combined talents of The Flaming Lips, Foxygen, Tegan and Sara, Moby, Dr. Dog, and others, this album simply does not work.